The global IT Services industry holds significant opportunities for industry players due to increasing IT spending in the healthcare, retail, and transportation sectors, among others. The market is forecast to reach an estimated US $1,147 billion in 2017 with a CAGR of more than 5 percent. Outsourcing locations such as India, China, Vietnam, and the Philippines are anticipated to be key drivers because of their low-cost labor and skilled talent pools. The APAC IT services industry is expected to register the highest growth rate among all regions during the forecast period and lead the industry. India is one of the fastest-growing IT services markets in the world. It is also the world's largest sourcing destination, accounting for approximately 52 percent of the US$ 124-130 billion market. The country's cost competitiveness in providing IT services continues to be its USP in the global sourcing market. The Indian IT and Information Technology enabled Services (ITeS) sectors go hand-in-hand in every aspect. However, the number of IT Services providers has increased very rapidly and selecting one from them is like looking for a needle in a haystack. 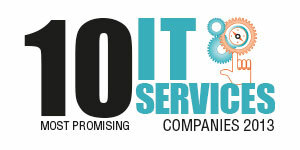 To help you select the most suitable IT Services provider, CIOReview presents to you the ’20 Most Promising IT Services providers’ in India. A distinguished panel comprising of successful and leading CEOs, CIOs, VCs, IT innovators and other VC funded companies along with CIOReview’s editorial board has decided on the top 10 promising companies.